Опубликовано 21 декабря 2015 г. Run Now Trigger a Scheduler job to run immediately. Service Bus queue and topic actions Create Scheduler jobs that post messages to Service Bus queues or topics by using .NET messaging or AMQP. In addition, there is support for brokered message property configurations and adding custom message properties. 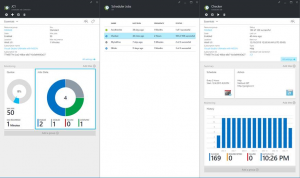 Azure Resource Manager support Scheduler is supported by Resource Manager, which gives you the capability for roll-based access control (RBAC), tagging, audited management operations, and deployment by using ARM deployment templates.